This professional grooming table is perfect for your pet dog or cat. With the hydraulic system, the table will raise the height of your pet so that you can reach him easily for bathing, trimming, drying, grooming or other pet care. The ribbed rubber surface of the table ensures your pets'safety. The rugged surface makes it easy to clean and remove hair and debris. The clamp-on adjustable grooming arm and security noose make it easier to groom your dogs and kitties. Made with a solid iron frame, the table is sturdy and durable for years. 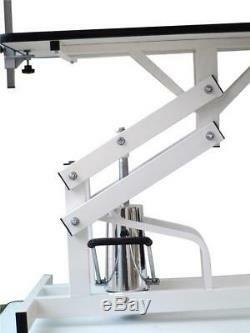 It is featured by a Z-Lift framee which provides extra stability and prevents the table top from wobbling. The hydraulic foot activated machanism provides you with easy, smooth height adjustment for convenience and flexibility. The table top features pebbled, non-slip plastic and rubber composite materials, while lined with premium aluminum alloy clamp to prevent absorption and warping of the wood underneath. The static free surface allows for easier cleaning and maintenance of your grooming table. 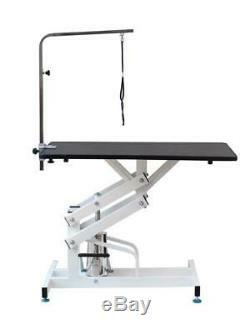 All grooming tables come with clamp-on style grooming adjustable. 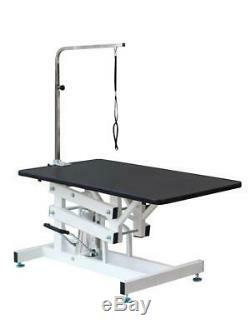 Color: Black and White Style: Z-Shaped Hydraulic Grooming Table. Materials: MDF(tabletop) + ironframe+ stainless steel(arm)+ premium aluminum alloy(clamp) Overall size: 108 X 60 X (54-92)cm/45.3" X 23.6" X (21.3" - 36.2")(L x W x H) Tabletop size: 108 X 60cm/42.5" X 23.6" (L x W) Table height from the ground: 54-92cm/21.3" - 36.2" Weight capacity: 200KG Height Of adjustable arm: 76cm/30. 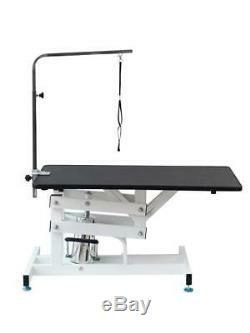 Package Includes: 1 X Hydraulic Grooming Table, 1 X Adjustable Arm, 1 X Noose. 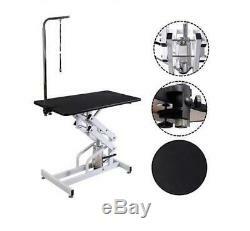 The item "Heavy Duty Hydraulic Adjustable Pet Grooming Table Dog Cat Arm Clamp Z Lift Fram" is in sale since Tuesday, June 26, 2018. This item is in the category "Pet Supplies\Dog Supplies\Grooming\Grooming Tables". The seller is "mzpartyinspirations" and is located in London, London. This item can be shipped worldwide.